In 1959 Len was awarded the Netherlands Government Art Fellowship by the Netherlands Institute for International Cultural Relations. Len, Pat and Frank left New Zealand in March 1960 with the intention of settling in England once Len had completed his Fellowship in Holland. Len and Frank had seen an advertisement for a property called Pointwell Mill in Coggeshall, Essex – whilst looking through a magazine called the Smallholder in the barber’s in Wellington – and planned to view it. The journey to the Holland ferry took the Mitchells via London and Harwich, and they stopped in the village of Kelvedon when they spotted a bookshop selling art prints. They told the woman in the shop that they were on their way to Holland but intended to return to Coggeshall and would need a place to lease. She was the owner of the Rood House. The trio continued on to Holland, with Pat returning to England ahead of Len and Frank and taking on the lease sight unseen. When they eventually came to view Pointwell Mill it was discovered to be in need of too much repair so they remained in the Rood House. Len and Pat on St. Stephen's Bridge with the Rood House in the background, 1962. Coggeshall is a small town near Colchester which sits on an old Roman road. It is recorded in the Doomsday Book and has over 300 listed buildings, including The Rood House, 33 Bridge Street - now split into two houses and known as Riverside Maltings (see listing here). The original house is thought to date back to the late 1500s and features a poppy frieze anecdotally credited to local monks, c.1600. Originally referred to as The Rood House, it was thought to be the site of a cross (rood) marking the entrance to the Abbey grounds, a guest house for the Abbey. The Abbey itself was established in 1140 and eventually replaced by a church in the 1500s. 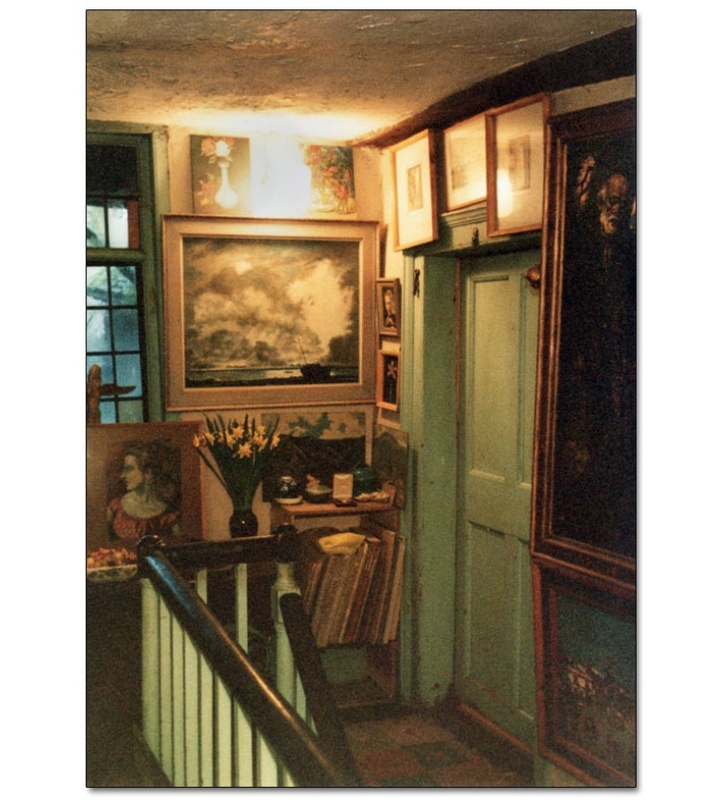 The poppy frieze is visible on the wall between Len's paintings. When Len suddenly passed away in January 1980, Frank and Madeleine Mitchell returned to England to bring Pat back to New Zealand. They were faced with the daunting task of packing up the Rood House, the place they had lived for the past 20 years, and preparing over 500 artworks for travel. The slideshow images were taken by Frank before packing began.